PELIK!! Lelaki Bertuah Ini Beli "SARANG" Dari EBay, Namun Selepas Membuka, Apa Yang Ditemuinya Amat TIDAK DI SANGKA-SANGKA! @When you spot a wasp nest, it’s already a big nope for you. While most people think it’s one of the scariest discoveries they can make, one guy intentionally bought a giant one from eBay. 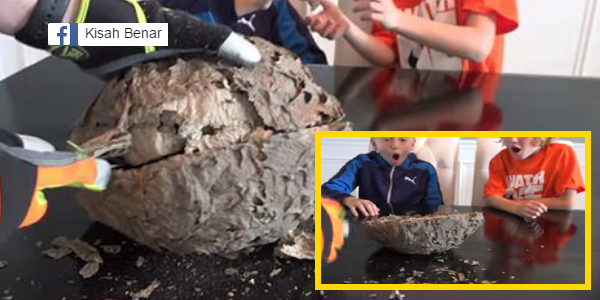 It’s amazing just how eBay has everything –even a wasp nest, but this guy actually got one just to show you what’s really inside it. You might start to imagine something from a sci-fi movie featuring alien creatures breaking their way out of a nest. But don’t worry, there’s nothing of that sort. Wasp nest can vary in size; some can be so small while others can be so gigantic, it’s urgent you need to call an exterminator. The one on the video actually had the same size or even a bit bigger than a basketball. It also belonged to paper wasps, which use plant material mixed with their saliva to construct their nest that resembles paper. The nests are home to these insects and it is where they lay their eggs and raise their hatchlings, so you should have a pretty good idea of what’s inside. Paper wasps are not really treated as pests; in fact, they are beneficial since they help with pollination via nectar feeding. They also feed on pest insects by turning them into larvae food. Despite this, they still shouldn’t be allowed to thrive near houses because they sting and they can be extremely painful. For those who are allergic to their venom, things can get ugly and deadly. 0 Response to "PELIK!! Lelaki Bertuah Ini Beli "SARANG" Dari EBay, Namun Selepas Membuka, Apa Yang Ditemuinya Amat TIDAK DI SANGKA-SANGKA!..."